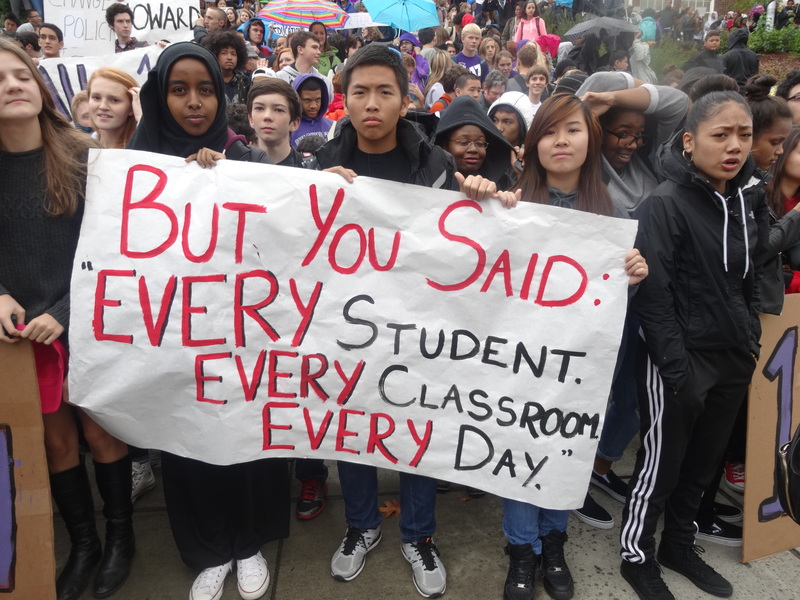 Seattle’s Garfield High School has once again moved into collective struggle!–and we may to find out today if one of us is to be displaced from the building or if the power of protest has kept us safe from the budget-cut ax for now. The Seattle School District announced on Friday, October 17, that Garfield High School would be forced to cut and transfer one teacher in a core subject area by Friday, October 24—or come up with $92,000. But on Thursday October 23, almost the entire building emptied in a mass walkout of students and educators against the budget cuts and has so far convinced the district to delay the cut. The morning of the walkout, one of my colleagues was in the middle of reading the list of grievances that the rebellious colonists proclaimed against the British in the Declaration of Independence. As he told it, the students didn’t yet grasp the world-historic nature of the defiant document and were slouching in their seats, somewhat uninterested. 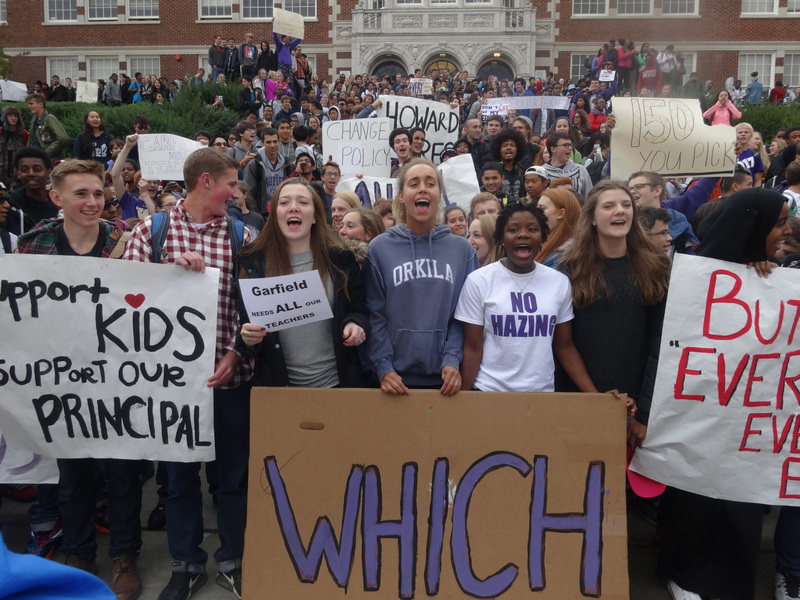 Then, a member of the Associated Student Body government burst in the room and began listing the grievances students had with the Seattle school district that was proposing to cut a classroom teacher of a core subject at Garfield. The ASB representative closed his remarks by urging the students to take action—much the way the Declaration of Independence concludes—by breaking the rules and walking out of school against the budget cuts. Upon the Paul Revere imitator’s exit, the class returned to the text of the Declaration with a new excitement and understanding of the importance of speaking truth to power. Among the objections cited by students and teachers to cutting a core subject teacher is that it would leave 150 students without a class and threaten the graduation of many. This is unacceptable, especially as Garfield has met its enrollment projections. The other schools that have been told they would be affected by the displacement of staff are Stevens and B.F. Day elementary schools, Denny International and Madison middle schools and Hazel Wolf K-8. Earlier this year another school, Gatewood Elementary, was told they would have to lose a teacher but the District gave them the option of raising $90,000 within one week to keep the teacher. The Gatewood PTSA was able to raise the money in a week and staved off the displacement of the teacher. While I am glad Gatewood was able to keep its teacher, it is simply unacceptable that schools with more wealthy PTSA’s can keep their teaching staff intact, while the res of the schools must face continual turnover. 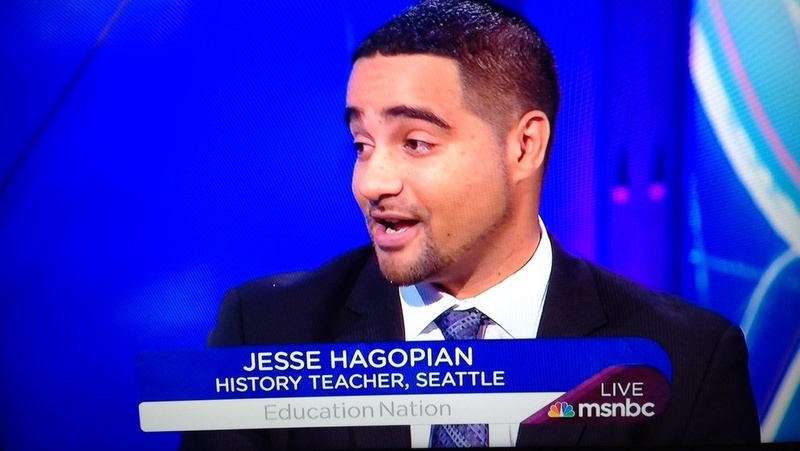 We must once and for all end the fiction of “separate but equal” schooling, especially when it comes to funding and resources. The teachers at Rainier Beach High School stand by you as you take a stand against unfair cuts that will cancel much needed classes and resources for your students. We know how it feels to be understaffed and under-resourced and expected to meet all of the needs of all of our students. It puts us in an impossible position and the students ultimately end up losing the most…An injury to one is an injury to all. This isn’t he first time Garfield has had a major walkout. The last time was in 2011 when hundreds of students walked out of school in opposition to the announcement that the state would cut $2 billion from healthcare and education. They marched to city hall and demanded a meeting with the mayor, who appeared and praised their initiative. The students received national attention for their efforts, even getting their picture in the New York Times. Best of all, only weeks after they organized a second city-wide mass student walkout, the Washington State Supreme Court—under considerable pressure from public education advocates around the state—ruled that the state legislature was in violation of the Constitution and would need to increase funding to education with billions of more dollars. Unfortunately, the legislature continues to violate our state Constitution, prompting an unprecedented “contempt of court” order by our state Supreme Court earlier this year. The whole history of the progress of human liberty shows that all concessions yet made to her august claims have been born of earnest struggle. … If there is no struggle, there is no progress. Those who profess to favor freedom, and yet depreciate agitation, are men who want crops without plowing up the ground. They want rain without thunder and lightning. They want the ocean without the awful roar of its many waters. This struggle may be a moral one; or it may be a physical one; or it may be both moral and physical; but it must be a struggle. Power concedes nothing without a demand. It never did and it never will. Motivating to see the youth in move.